I recently went on vacation and managed to study a bit on airplanes and during down time. I took a few books with me. Perhaps the one that got my best attention was Hands of Light: A Guide to Healing Through the Human Energy Field by Barbara Brennan. I especially enjoyed the sections on how to see the universal energy field and auras. I was in an airplane when I read the part about orgone and how to see it in the sky. I looked out the window and there it was, moving energetically about in a dizzying dance. I know I’ve seen it before, but I always thought it was something in my tears. Thinking about it, there was no way anything in my tears could have been moving as fast as what I saw. I then read about the human aura. She described the various layers of the aura and their function. I looked up at the other passengers in the airplane. Again I found myself able to see. This time I saw a faint glow around the heads of the other passengers usually about an inch or two wide. In most cases it was white or faintly blue, but I also noticed a bit of pink around one woman. 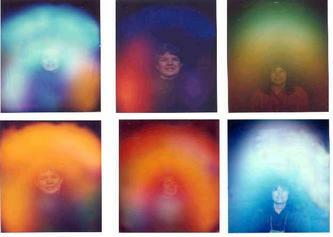 I’ve seen auras before, but it was several years ago. I was making the effort then, having heard of them and being curious. I looked in a mirror and saw a thin magenta aura around me. In a bookstore, I saw a woman with a beautiful lemon yellow aura. And once while driving, I saw a man and a boy walking on the sidewalk. Around the boy, I saw a brilliant white aura. It startled me because I wasn’t expecting it. Since that time until reading the book, I hadn’t seen any auras. Fear must have shut down the ability during that time. Now I am again seeing the lower layers of the glow. I’m so thrilled!